Puerto Galera on the island of Mindoro is only a few hours travel from Manila by land and sea transport. It has beautiful beaches, good access to the interior and some of the best diving sites in the Philippines. All this makes it a popular travel destination. Puerto Galera refers to the town of Puerto Galera and the resort areas surrounding it – namely Sabang, 5km to the east, and White Beach, 7km to the west. The bus journey from Manila to Batangas takes about 2 hours. The ferry from Batangas to Puerto Galera takes about an hour and a quarter. Being fairly close to Manila makes Puerto Galera a reasonably cheap and easy to reach destination. Bus Terminal close to the corner of Taft Avenue and Gil Puyat Avenue (formerly Buendia), Pasay City – this terminal is nearest the Airport. Terminal near Ali Mall, Araneta Center, Cubao, Quezon City. EDSA corner Kamias Street, Quezon City. Take the bus straight to Batangas Pier. From Batangas Pier, there are several operators running boat services to Sabang, Puerto Galera (Muelle Pier), or White Beach. The fare is about 150 pesos. Another option is to use the daily combined bus and boat trip operated by Si-Kat ferry. This leaves from the Citystate Tower Hotel in Manila, where tickets can also be booked. There is also an office at Muelle Pier in Puerto Galera. This is a slightly more expensive option, but easier and more convenient. I have used this service and found it hassle-free, with a comfortable bus journey, definitely worth the extra money. The actual sea crossing can occasionally be a bit rough, so take a travel sick pill if you get seasick. Note that the busy time is April and May, which are best avoided if possible, as room rates can be double or even triple the normal price. Many people holiday here during the long weekend in Holy Week. 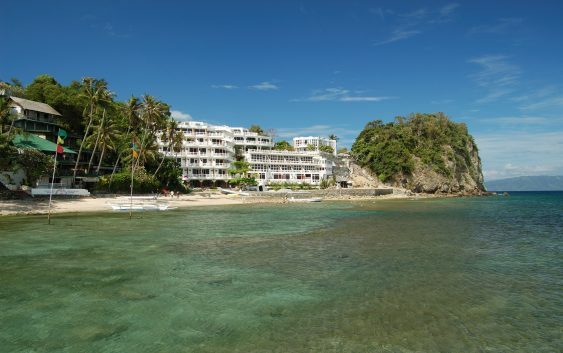 The beachfront area at Sabang consists of a mixture of hotels, bars, dive shops and restaurants. The bars are lively on an evening and the many restaurants serve an excellent choice of local cuisine and fresh fish. I have found Sabang an excellent base from which to explore the surrounding area. Divers are well catered for in Sabang. There are a number of spectacular dive sites only a short boat ride away. The are still a few quieter hotels and resorts on the beachfront away from the main bar and restaurant area such as the Seashore Beach Resort. Small La Laguna Beach is only a five-minute walk from Sabang with a better beach and a more relaxed atmosphere. Further along still is Big La Laguna Beach which has a nice beach and also accommodation available. Coco Beach Resort is west of Big La Laguna and is a great place to stay. It is a four-star resort with about 90 huts and cottages hidden amongst the palm trees of a big beach. It boasts its own restaurants, serving a wide variety of dishes. If you want to explore outside the resort, it’s easy and cheap enough to hire a boat and take the short trip to Sabang or a bit further afield to one of the many surrounding beaches. If you wish the resort will book a complete package including travel from Manila. White Beach is also a popular tourist destination. There are plenty of hotels, bars, shops and restaurants here. Because of that, the area can be quite crowded and noisy. However, it does have a long beach with fine white sand and if you are on a tight budget it is a good alternative to Boracay. There are plenty of water activities on offer on the beach. Night time is very busy. Aninuan Beach lies to the west of White Beach and is a much more peaceful place to base yourself. It boasts a nice wide, clean beach and a relaxed atmosphere. Around October time it’s possible to see fireflies. About 1km from Puerto Galera on the road to Sabang is a bunch of quiet resorts where you can hide away from the bright lights if you wish. I have stayed at the Tanawin Beach Resort which is very quiet and has a quiet beach a short walk away at the bottom of a steep path. A bit too quiet maybe, I did travel most nights to Sabang by tricycle for a meal and a bit of nightlife. The seas around Puerto Galera teem with exotic and colourful marine life and coral gardens. It is a year-round destination for both experienced divers and beginners. Puerto Galera boasts over 30 quality dive sites, all with superb visibility. Consequently, the diver is well catered for at all the resorts. 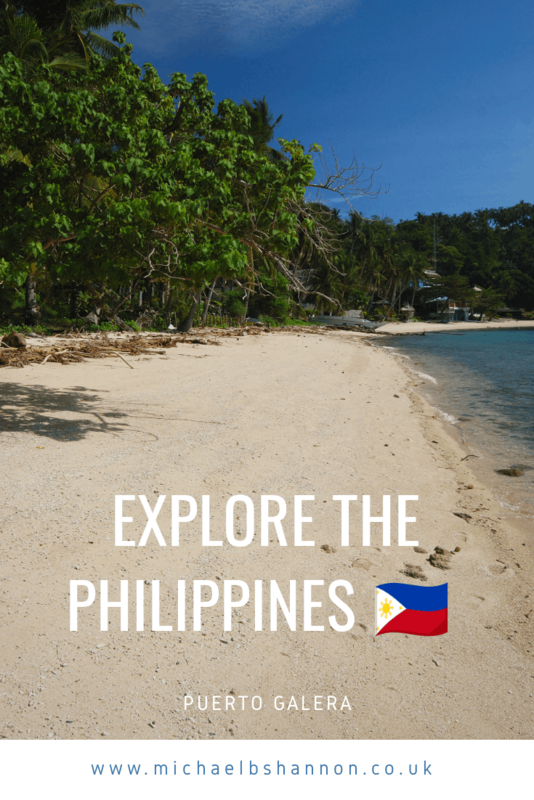 Beach exploring: there are about 30 beaches in Puerto Galera giving you lots of choice. Dolphin Watching. This can be arranged with a local boatman. When I went, I did see a large pod of dolphins but had to go quite a way out to sea in order to do so. Hidden Valley. This is a little off the beaten track and can only be reached on foot or Caraboa. Mangyan Village. The Mangyan people are the original natives of Mindoro, now in the minority. They have managed to preserve their culture by avoiding modern influences. Tamaraw Falls, (15km from Puerto Galera on the road to Calapan). Muelle Bay. The bay is a beautiful natural harbour where some of the ferries and boats dock. Around the bay is a row of restaurants, shops and bars where you can sit and enjoy the view of the scenery. As you walk about Sabang or White Beach you’ll no doubt get approached by people offering a trip to one or more of the above places. These are often a full day out by Jeepney and include your lunch and are very reasonably priced. If you want to visit a nice beach, ask one of the local boatmen to take you to one. Coco Beach Resort, Puerto Galera. Tanawin Bay Beach, Puerto Galera.